Zoehfeld, Kathleen Weidner. What Makes a Blizzard? Maddie Frost, Illus. Non-fiction. Let’s Read and Find Out Science Series. HarperCollins, 01/2018. 35pp. $17.99. 978-0-06-248473-4. PB $6.99. 978-0-06-248472-7. HIGH ADDITIONAL. GRADES 1-3. 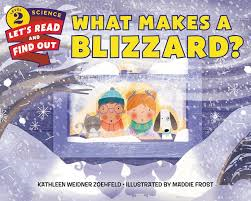 This non-fiction book for early readers, part of the long-stand­ing Let’s Read and Find Out Science series, begins with a re­counting of the 1888 “Schoolchildren’s Blizzard” and proceeds to inform readers about the conditions that are necessary for a blizzard to occur. The digital art features clean lines and angu­lar people, who all appear white in the 1888 scenes and who display a variety of skin tones in the modern day scenes. Facts are accurate and clearly explained, and frequent sidebars offer additional related information and vocabulary words. The book includes a glossary as well as directions to create a weather journal but does not include sources or suggestions for addi­tional reading. This book will be a welcome addition to most early reader collections.